San Diego is the perfect year round destination. 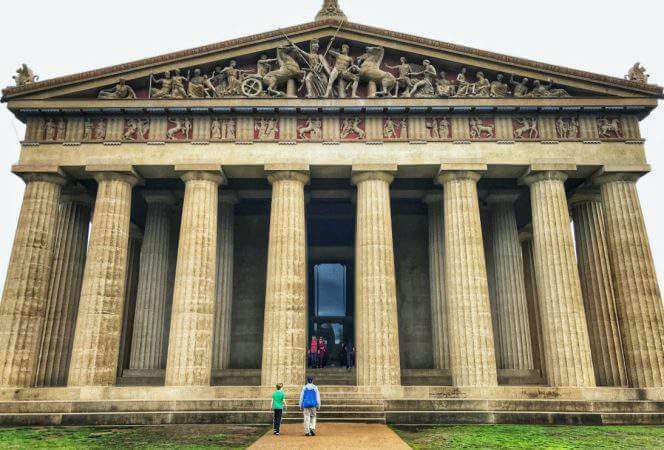 Not only are there unique neighborhoods to explore throughout the county, but also world class attractions and dining. With 70 miles of coastline running along the Pacific Ocean and copious amounts of sunshine, it also has plenty of beaches for ocean loving families. 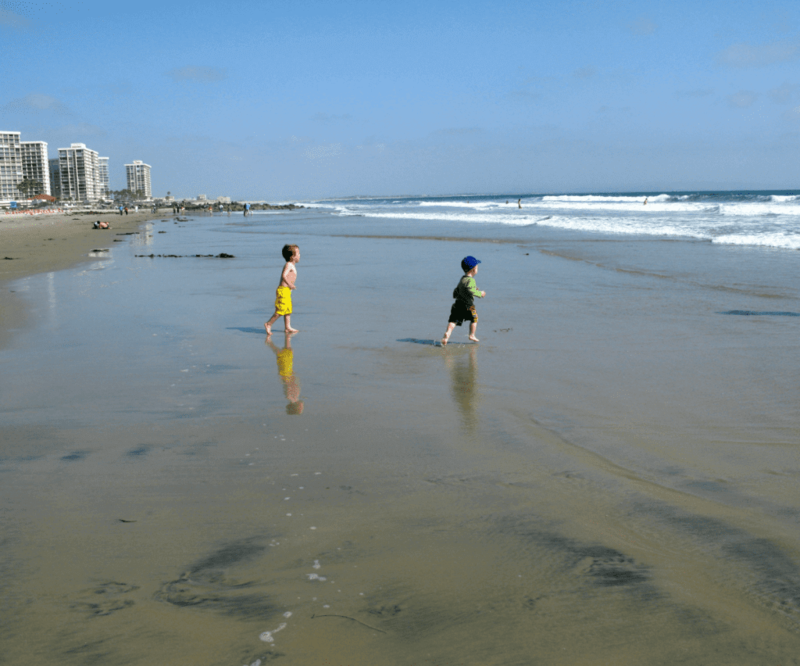 After many years of visiting and living the city, these are the best beaches in San Diego for families we would recommend. *This post is sponsored by Moon Travel Guides San Diego and contains affiliate links. If you purchase something I may receive a small commission. As always, opinions are 100% my own. Located on Coronado Island just over the Coronado Bridge from downtown San Diego, is the charming historic town of Coronado and one of the best San Diego hotels on the beach, the Hotel del Coronado. The town happens to have the most stunning beach in the county. A mile and a half in length, the best stretch of sand runs from Hotel Del to Dog Beach at its far north end. Families can find parking anywhere along Ocean Boulevard running parallel to the beachfront. Public restrooms are available at various designated spots along the beach, but sometimes it is just as easy to go into town and use the restroom there. One of the best things about the beach at Coronado is the sparkling sand. Kids will marvel as their skin listens from the mineral mica that covers the sand and water like fairy dust. The beach is regularly chosen as one of the best in the country due to its expansive area of clean, white sand, mild waves, and beautiful views. Children will love running on the large, flat beachfront. What I love about La Jolla Shores is that it is a beach with a playground and grassy picnic areas on site at Kellogg Park. This will keep kids busy for hours because once they tire of the sand, they can head for the play structure, or vice versa. It’s a great reason to pack a lunch or snacks and stay for the day. Parking here can be challenging on weekends or school holidays, so come early and park in the free lot or on Camino del Oro. Another option is to park at the nearby La Jolla Shores Hotel or La Jolla Beach and Tennis Club, but it won’t be cheap. The sand is soft, the waves are gentle, and the sunsets are gorgeous at La Jolla Shores, just make sure you get here early for the best seat. Torrey Pines State Beach is actually a beach and nature reserve. There are 2,000 acres throughout the park to be explored. 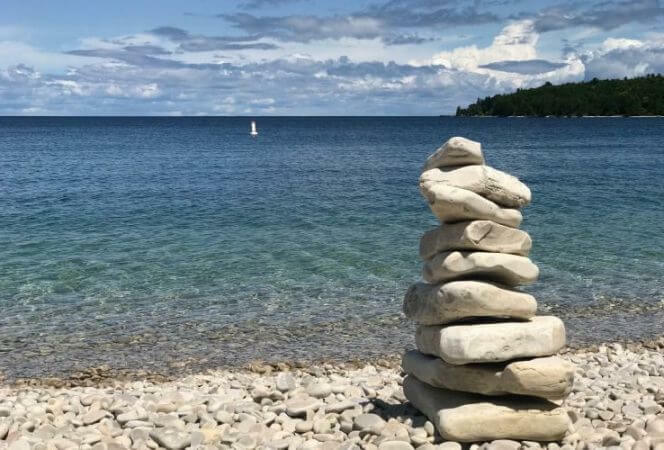 Families with younger children might want to head straight for the beach, but for those wanting to explore the diverse landscape, unique terrain, and fauna of the area, plan on parking in the pay lot off the highway and bringing hiking boots. 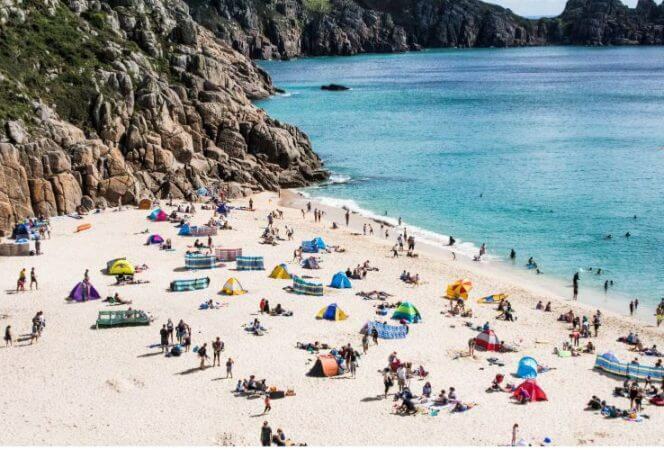 Those that would rather bring flip flops and beach towels should park off the shoulder of the highway and head for the flat soft sand of the beach. There is a lagoon area where children often like to explore under the highway overpass. Take note that the north part of the beach is more family friendly, while the southern part (Black’s Beach) is clothing optional. Restrooms are available at the north end of the beach and near the parking lot, but there isn’t much else in the area. If you’re planning to stay more than a couple of hours, bring some food, but be sure to take out whatever trash you bring in. FYI: The bluffs that overlook the beach have been known to collapse, so be careful when going near the edge. This is also a popular jumping off point for paragliding and kids will enjoy watching them above and possibly spotting the occasional dolphin or whale out in the ocean. This is the view looking north from the top of the trail down to Torrey Pines beach below. 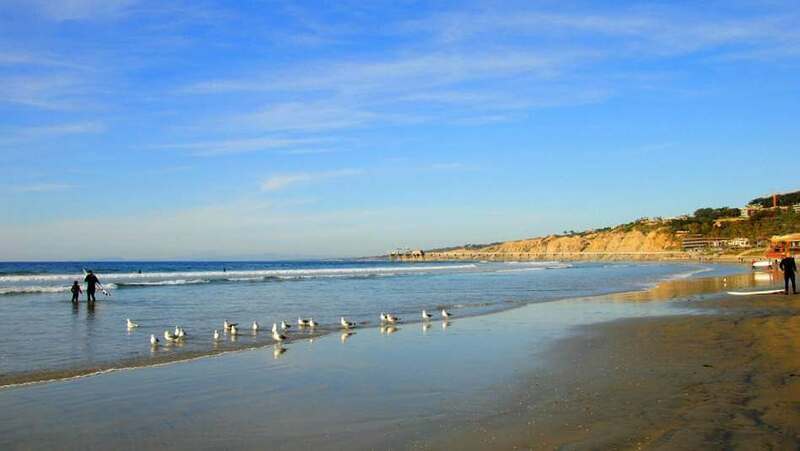 Del Mar has a beautiful stretch of San Diego beach located below the city’s two coastal parks, Powerhouse and Seagrove. The parks have expansive grass areas for kids to run and play, or families can pack a picnic and enjoy the view. The beach is adjacent to town with its restaurants and shops so parking can be difficult to find. The north end of Del Mar beach has a dog park and the southern end is less groomed and more rugged. Families will enjoy exploring the beach any time of day. 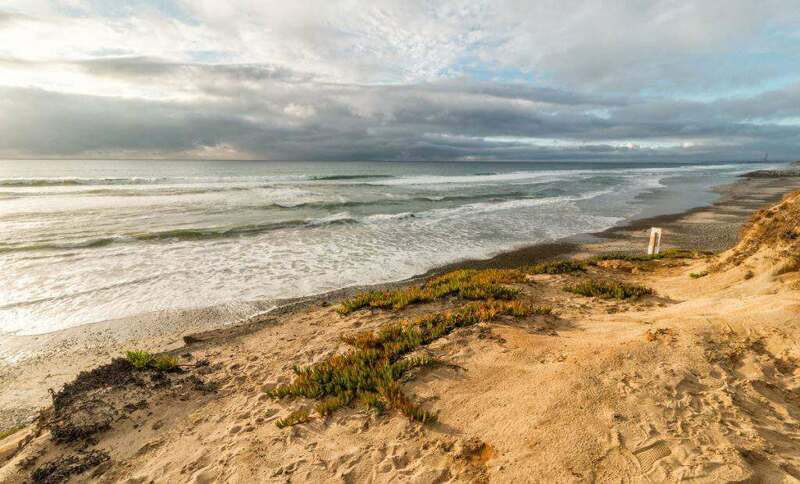 Many families visit Carlsbad for its major attraction, Legoland, but the city happens to be home to a seven mile stretch of some of the best beaches in San Diego county. From South Ponto Beach on its southern end to Tamarack Beach on the north, the beaches have something for everyone. At South Ponto beach, children will enjoy the Batiquitos lagoon and the smooth stones, shells, and critters that are left behind when the tide is out. The sand is smooth, the beach is wide, and there is a parking lot above the beach and along highway 101. 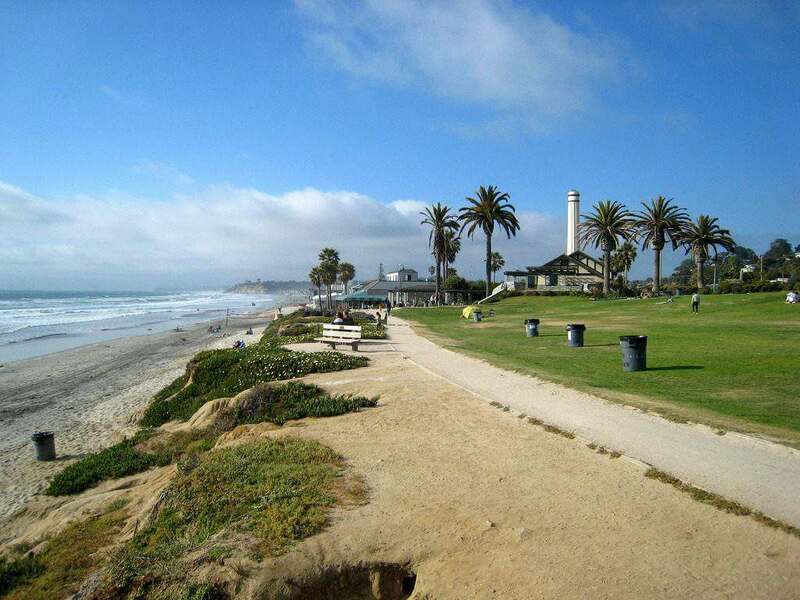 Further north is South Carlsbad State Beach, a campground that is extremely popular during the summer. Campers have access to the beach below via a staircase from the bluff. 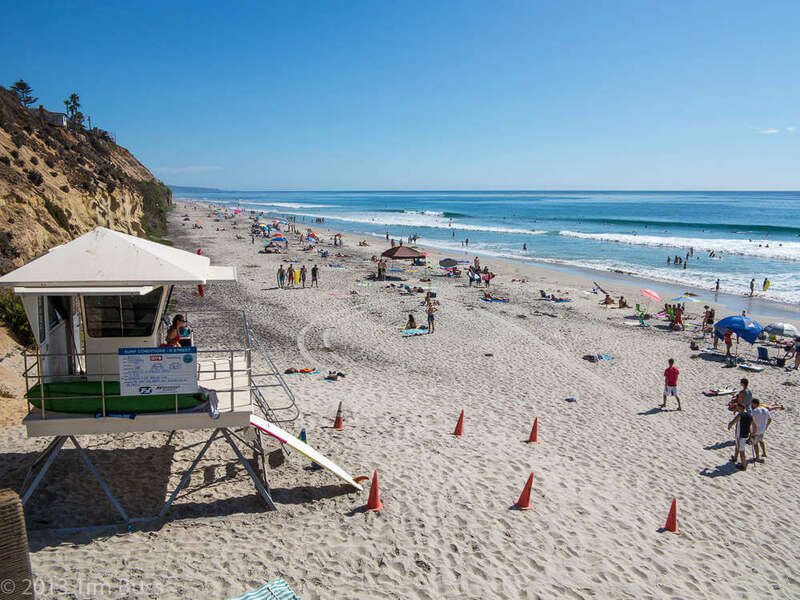 Families at the campground however tend to head to South Ponto because there are no restrooms at South Carlsbad, so while it may be a great place to stay for the night, plan on heading to a different beach during the day. 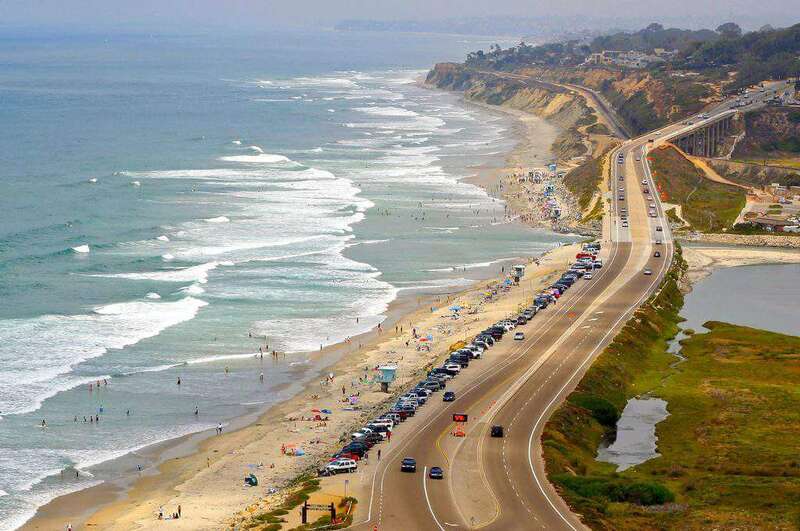 Tamarack Beach (also known as Carlsbad State Beach) is the best for families looking for swimming, surfing, or fishing. There’s a beautiful bike path along the beach for rides or family walks. Parking can be found on Carlsbad Blvd. and on surface streets nearby. If you don’t have any luck, head back to the lot by South Ponto. Tamarack is the place to be when the sun meets the Pacific Ocean at dusk. Locals love Moonlight Beach in Encinitas located in this north county beach town. The beach appeals to families with its designated play area, snack bar, and restrooms. The beach has some perfectly groomed spots for volleyball or football games. Parents will love being able to find a spot on the beach where they can relax while children play nearby in the waves. There is a pay parking lot above the beach, but there is ample street parking as well. When families are finished for the day they can head into the town of Encinitas for a quick bite to eat or grab an ice cream at Handel’s. A perfect beach day at Moonlight Beach. San Diego’s beaches are in a class of their own. They offer everything from swimming to surfing, parasailing to fishing. Whatever your family desires, there is a good chance of finding a beach to suit your needs. In our opinion, these are the best family beaches in San Diego, but you can’t go wrong in a county with all this sand, the Pacific Ocean, and stunning sunset views. Looking for other beach destinations? 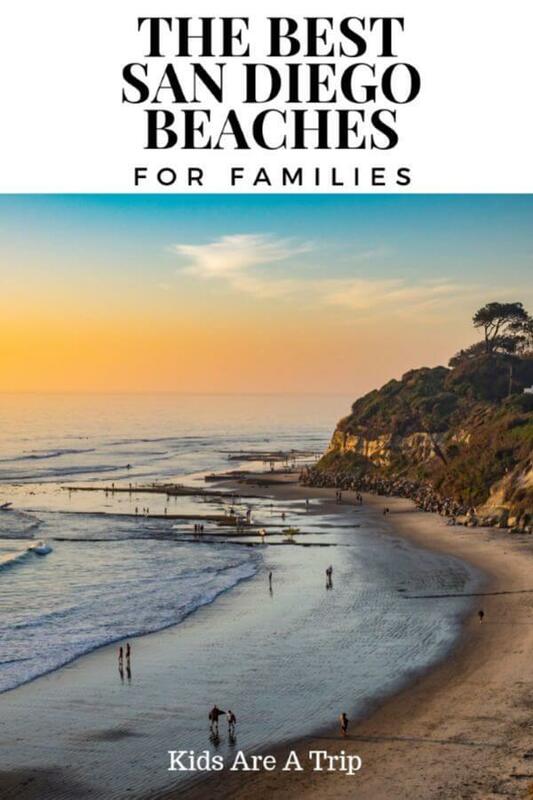 Check out our posts: The Best Kid Friendly California Road Trip Stops 25 Favorite Beaches in the US for a Family Vacation and Favorite Family Beaches Around the World. Don’t forget your copy of Moon Travel Guides San Diego written by San Diego native Ian Anderson! *This post originally appeared on this site in March 2016 but was updated in January 2019.